Imagemaker360 is a leading Virtual Tour Hosting Platform for Real Estate, specializing in fully Narrated Virtual Tours and HD Videos. We are also a high-quality, low-cost, turnkey Virtual Tour provider and hosting solution for Real Estate Photographers, Commercial/Industrial, Tourism/Resort, Retail, Retirement, and other web marketing users. As a Virtual Tour Service Provider, we provide posting to Realtor.com and low-cost tour hosting for other independently owned and operated photography companies, photographers, web developers, realtors, and brokers. We are proud to be the leading professionally scripted and narrated Virtual Tour provider with an outstanding network of qualified and professional photographers. Please take a moment to watch and listen to some of our recently completed audio tours. We would highly recommend Imagemaker360 to anyone who wants to set themselves apart. Don't miss using their Narrated Virtual Tours! They are phenomenal! 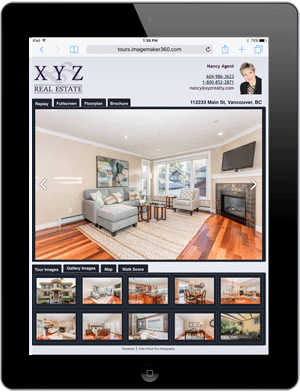 We have been using the professional services of Imagemaker 360 for the past few years and would recommend them to anyone who wants to showcase their listings with photos that will engage potential Buyers right away! The photos are professionally taken and we appreciate how the photographers are careful with attention to those little details – such as lighting, best angles, placement of curtains, pillows, etc. which helps to promote our listings in the best possible way. The other feature that we absolutely love is the Narrated Virtual Tours. This feature allows us to showcase the special features of our listings that we want to be sure we highlight - especially any of those unseen features you don’t want a Buyer to miss, the property’s location, nearby amenities etc. And they write the script for us! The script is always completed very quickly and then narrated by a professional announcer as the tour goes through all the rooms of the home. We have been told many times by both Buyers and Sellers that they feel this feature adds a whole new dimension to virtual tours. Buyers seem to warm up to being able to really "tour the home" with this personal touch. Silent tours are like silent movies – the narration makes it so much more interesting! We always use the Narrated Virtual Tours option and in fact show a demo at listing presentations. On a recent listing presentation our client felt this service set us apart from the other two agents he called in. We ended up getting the listing!! Thank you so much for the incredible job that you did on my virtual tour. The narration product was amazing and the process could not have been easier. Your script writer and announcer did an incredible job creating the script using just a few notes that I provided. Everything was very professional looking and sounding. We received 10 offers on the home and I have no doubt that this was in part to the incredible virtual tour that you did. I look forward to selling many more homes using your tours as part of my marketing plan. Last month, I received two prestigious properties to list in Toronto worth over $2.4M. I researched the local Virtual Tours being used and I decided to contact your office, as you add more class and uniqueness. Imagemaker360 arranged floor plans(online and hardcopy), a great photographer, a domain name(address of property), a webpage, image and virtual tours with script and male narration. On completion, all times lines were met, results were all of top quality and my clients were very very impressed along with other real estate agents who came to our open houses. Imagemaker360 provides a Virtual Tour Partnership and Hosting Program for independent photographers looking to provide Virtual Tours to their clients. These platforms are popular with photographers looking to expand their business. CLICK HERE FOR MORE INFO Call or email us to find out more about using the Imagemaker360 platform for your business. Imagemaker360 has a photographer network across the United States and Canada offering professional photography and virtual tours. Our virtual tours are customized and individually reviewed to enhance the images and showcase the property. All of our tours are fully compatible on mobile devices and tablets. A carefully written custom script, voiced by a professional narrator that can tell the whole story. Your tour will be custom branded to you, using your personal branding, images and color palette. Your floor plan can be integrated with your tour using hotspots, showing where the images are throughout the home, creating an interactive experience. 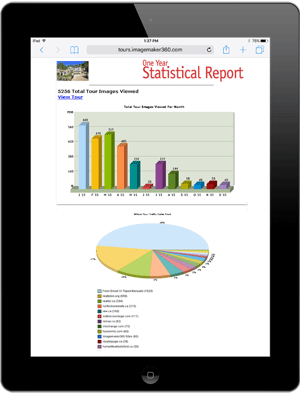 Receive weekly emails showing the growing traffic for your virtual tour. A copy can also be sent directly to the homeowner. A high definition video version is created from every tour and posted to YouTube. A brochure template is provided with every tour. 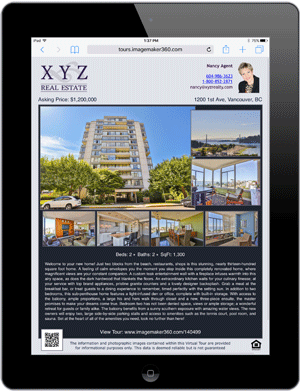 Simply select the images, enter the property information and a create a printable PDF brochure in minutes. Imagemaker360 does not charge a monthly fee, start up fee or a tour volume penalty. You simply pay for the tours when you need one. When you become an Imagemaker360 provider, you can choose to pay a fee per tour and charge your clients directly. Alternatively, Imagemaker360 can bill your clients for your full package cost and send you your portion. Our Imagemaker360 providers have an account set up in our system where they can manage their client's tours, upload images and place new orders. Our Imagemaker360 staff review each tour to give customized movements to the images and then create a video version of each tour. Your client will then receive a completed tour link and a link to a Tour Management Center where they can take advantage of all of the features Imagemaker360 has to offer! Imagemaker360 has live Customer Service staff to assist your clients with their tours and management center, as well as support for you as a provider! If you require more information, please call us at 1-800-852-2871. No amount of dazzling visual effects can convey a fraction of the salesmanship provided by rich, professional narration. A carefully written custom script voiced by a national-caliber narrator can tell the whole story. 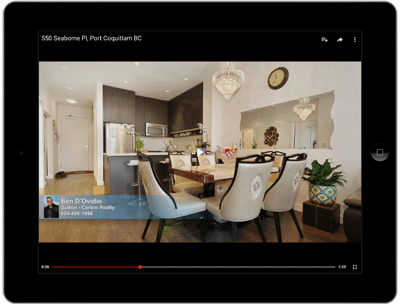 Here are the compelling sales points that helps showcase a property in a narrated virtual tour. Inform the viewer about the location and nearby amenities. Tell them about hidden features of the property. Brief them on community standards or restrictions. Our English-language narrations are voiced by our gifted, professional and experienced narrators. Our voice is "selling" for you and for your seller, nothing less is acceptable. Every narrated tour offers up to 2 foreign language translation at no additional cost. Extra languages beyond these can be added for just $2.99 each. 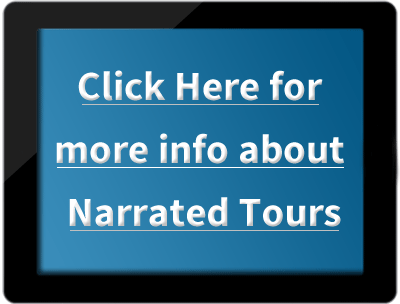 Once directed to proceed with scripting and narration, our tours are typically completed in under 24 hours, and the average time is much faster. Our newest innovation offers greater control for those looking for a more hands-on, customizable narration program with the opportunity to direct all or part of the process. For a small fee, you can proof and modify your completed script, select the announcer and background music, and choose either/or the announcer and the music. This is the program for you if you are looking for more input over the script and narration process. Additionaly, 6 foreign languages can be chosen with the option of selecting the announcer you want from our professional IM360 male and female voice talents. Currently we do not have photographer coverage in this area. If you would like to create a tour using your own images, please contact us for information on getting started. Imagemaker360 provides a Virtual Tour Partnership and Hosting Program for independent photographers looking to provide Virtual Tours to their clients.